Solid Signal sells a lot of splitters. Yeah, a lot of them. At the moment I’m writing this article, we’ve got 3,887 listed. How can a regular person understand which one to get? Obviously there are 2-way splitters, 4-way splitters, 8-way splitters, et cetera. This article isn’t really about that but let me just get that discussion out of the way. You should use the smallest splitter that you can get away with. If you think you’re future-proofing your system with a big splitter, what’s really happening is you’re making your current system less reliable. You should also generally avoid splitters other than the 2, 4, and 8. Odd numbered splitters usually have the same loss as the next even numbered ones (in other words a 3-way is as bad as a 4-way) so you’re just losing ports. Splitters bigger than an 8-way are literally causing you to lose over 90% of the signal on each port. That’s a bad deal too. All splitters, in fact all cables and devices made for any sort of video, have a defined bandwidth. Coaxial cable is able to carry all the things it does because different signals take up different “parts” of the cable. It’s very much like FM radio. There are many different signals and by “tuning” a different frequency you can get a different signal. So, in order to work with different devices, you need equipment that can work with that device’s bandwidth. Different kinds of things use different frequencies so that whenever possible, they can share the same wire. If two services use the same frequencies, then they can’t be used on the same cable or in the same splitter. TV antennas actually are the simplest things you can connect to a splitter. Broadcast TV technology may have gone digital, but the technology used to broadcast it is almost 100 years old. So, the requirements aren’t that great for a splitter. Look for a splitter than can handle 50-800MHz. Generally you will find splitters that work with much larger ranges. If you have a splitter with much more range, like one of the ones below, it could work for you. There’s a lot packed into a cable system and it takes a lot of bandwidth. Cable TV uses the same bandwidth as broadcast TV but adds more. The lower frequency ranges are usually used for internet while the higher ones let you have more channels than you can get off broadcast. Here, choose a splitter that can handle 5-1000MHz. This is the generally acceptable range for a splitter for that kind of system. However, each cable system is different. If you already have a splitter in your house, see if it has specs on it. If it’s not “provider-branded,” in other words if it doesn’t say “Spectrum” or “Comcast” on it, then we probably carry the exact same one. Cell boosters use the same frequencies as the cellular radios. These frequencies are higher than broadcast television so that there isn’t any interference between the two. Generally, cell booster splitters are the same as older satellite TV splitters, because they use many of the same frequencies. For cell boosters, your splitter needs to work with frequencies from 600-1900MHz. As I said above, it’s ok if the frequency range is bigger than that. Satellite TV systems are the most complex. Satellite TV systems carry thousands of channels from multiple sources. Not only that, a satellite system is usually designed to work with cable internet, so that professional installers can put them both on the same wire. Satellite TV splitters must handle frequencies from 5-2150MHz. While the satellite part is really only 900-2150, that extra range is used to let cable internet signals go through the same splitter if need be. In modern DISH systems, there are devices that look like splitters but are actually referred to as “nodes.” They help distribute the signals from a Hopper DVR. While DISH Hopper setups can also use splitters, if what you see has a DISH logo on it, it’s a node not a splitter and the two aren’t interchangeable. Modern DIRECTV systems use special splitters. 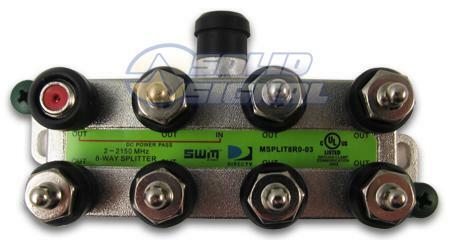 These splitters are rated from 2-2150MHz but really just use three ranges: 2.3MHz, 450-600MHz, and 1700-1850MHz. These special splitters allow DIRECTV receivers, DVRs, and clients to talk to each other efficiently. DIRECTV splitters are actually not very good for “general purpose” use and shouldn’t be used that way. If your splitter has a green label with a DIRECTV logo, it should only be replaced with another splitter that looks the same. If you’re looking to expand, the easiest thing to do is find another splitter that is the same brand but has more ports. There is usually a model number and brand logo on every splitter. By doing this, you’ll know that you’re ok. If you’re starting from scratch, just find a splitter that matches the bandwidth that I’ve laid out above and everything should be fine. Of course, you’ll find the best selection at SolidSignal.com.